There is no point in even talking about anything else right now. After teasing it since the end of last season, HBO finally took us to Shogun World in this week's episode of Westworld. So, did it meet the expectations and buildup? Let's dig in, shall we? 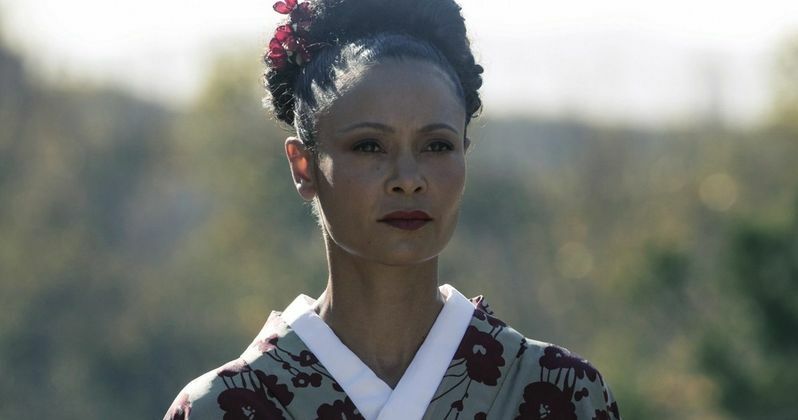 This week's episode of Westworld, titled Akane No Mai, did a few things, but we spent the vast majority of our time with Maeve (Thandie Newton) and her not-so-merry band of misfits in the land of the Shogun. As Simon (Lee Sizemore) explains, Shogun World is for those who find Westworld to be too tame. Apparently, there are some who need an extra layer of bad layered in with their murder and debauchery. They soon discover, upon being captured, that Shogun World largely mirrors the main park. Not only in relative appearance, but Armistice (Ingrid Bolso Berdal) and Maeve quickly recognize that they have a counterpart in this park. This goes far beyond looks. Simon, as it happens, plagiarized his own work more than a little in creating Shogun World. Essentially, the gang gets caught up in an initial conflict and Maeve, discovering that she and all of the hosts have the ability to speak any language any other hosts speaks, talks her way into favor with the Ronin warrior who captured them and with the Geisha who they are staying with. They wind up getting stuck in one of Simon's narratives, which pretty much allows us to watch a short samurai flick unfold for the majority of the episode. Yes, there are thematic things that will have an effect on the show later, but really, this was Westworld showing off what it can do to some degree. It serves as an incredible tribute to samurai cinema. It's visually stunning, there is a ridiculous amount of great action and fight choreography, the side story told is compelling and it's honestly a little weird in kind of a fun way. Shogun World did not disappoint. As for the larger things that will stick with us going forward. Simon thought he recognized the narrative they were caught up in, but it soon became clear that things are no longer going as they once should have. Maeve found a lot of herself in Akane (Rinko Kikuchi), who served as a mother to Sakura (Kiki Sukezane), who was in the middle of a conflict between the Geisha and the Shogun warriors within this broken narrative. In trying to help defend Sakura, Maeve discovers that she has mind control, or something of that sort, over the other hosts. She is accused of being a witch and, honestly, that may not be too far off from where we ultimately end up. Maybe Maeve is a witch. I mean hey, they've got at least six parks. Can you imagine going to Witch World? Anyway, once they are all brought to the Shogun warrior base of operations, things get ugly. Their leader kills Sakura and, in turn, Akane kills him after a pretty amazing dance/murder scene that frankly just needs to be seen. Maeve then shows her witchcraft on full display, making all of the Shogun warriors kill one another. Simon is obviously distressed by this but the cowardly man is happy to be alive. This witch business, as I'm going to call it for now, is surely going to have major implications moving forward and is easily one of the weirdest things the show has introduced so far. But, it could be cool. Oh, and Simon found himself a radio while taking a pee, so that is probably going to come into play later. Elsewhere, we briefly caught up with Bernard in the present timeline with the Westworld clean-up crew who are finally dealing with all of those dead host bodies from the first episode. Karl (Gustaf Skarsgard), head of the response team, gets some bad news; about a third of the hosts have been totally erased and there is no explanation for what really happened. Also, one of those host bodies definitely looked liked Teddy (James Marsden). Is he dead in the present? Given what happened with him and Dolores this time around, that wouldn't be so surprising. Dolores (Evan Rachel Wood) is trying to get herself a train to go find her father, the highly-in-demand Peter Abernathy (Louis Herthum). She puts her team to work in the absolutely obliterated town of Sweetwater. This leaves her and Teddy some time to reconnect, which they do through a series of uncomfortable conversations, because as we know, Dolores is straight-up crazy now. She mentioned that her dad once burned a bunch of cows to death in order to save the herd and, that eventually becomes a metaphor for what she's going to do to poor old Teddy. After the lovers bump not-uglies, Dolores takes Teddy to the barn and has a captured Westworld employee dig into Teddy's programming to make him less soft. After he neglected to kill the rest of the Confederates last week and after suggesting they run away together this week, she saw no other path to success. We don't see Teddy's ultimate fate, but it doesn't look good. So, we're left to wonder what happens there and how Maeve is going to use her witch powers to stop an oncoming army of warriors in Shogun World. We sadly didn't catch up with The Man in Black and his newly discovered daughter this week, but odds are, that's coming our way when Westworld returns on HBO next Sunday.